MOLLUSCA : NUDIBRANCHIA : Embletoniidae SNAILS, SLUGS, ETC. 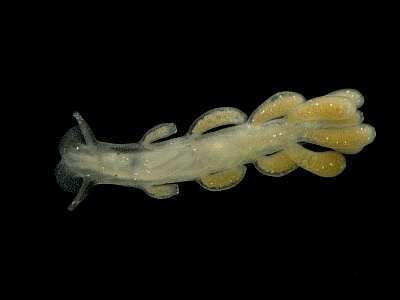 Description: The ground colour of this aberrant dendronotid nudibranch is translucent white. Each ceras contains orange-brown lobes of digestive gland, that are visible through the epidermis. There may be up to 7 pairs of club-shaped cerata on the sides of the dorsum. There is an increase in the length of the cerata towards the posterior end of the animal. The head is heart-shaped, the rhinophores are smooth, oral and propodial tentacles are lacking. Adults grow to approximately 7mm. Habitat: Reported to feed on a variety of shallow water hydroids. This species was previously classified as an aeolid due to its posession of cnidosacs and unbranched cerata. It is sometimes found interstitially amongst coarse gravel or sand. Distribution: Found all round the British Isles and from Norway to the Mediterranean. Not often recorded due to its minute size. Unbranched cerata-like gills in pairs along the sides of the back. Head with rhinophores and lateral oral flaps but no oral tentacles. Picton, B.E. & Morrow, C.C. (2016). Embletonia pulchra (Alder & Hancock, 1844). [In] Encyclopedia of Marine Life of Britain and Ireland.